Is it possible to measure hemodynamic changes in the prefrontal cortex through the frontal sinus using continuous wave DOT systems? Full field optical coherence tomography movie of conjunctival blood flow in the human eye See Scholler et al. 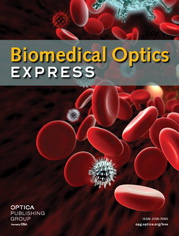 Biomedical Optics Express 10, 731-746 (2019).